Setting out vegetables for hungry kids. It helps that a 50-cent cucumber with yogurt dip is cheaper than a bag of chips. that looks like such a yummy snack! Aldi has had good deals on the "Fit and Active" rice cakes...I buy the plain ones and put a bit of peanut butter on top and they love it! Cheap and Healthy! Cucumbers are my favorite healthy snack. I usually buy 2 English cucumbers each week just for snacking. I have a large Tupperware serving piece with divided compartments and lid that I keep in the fridge stocked with cut up veggies. It's the best habit I've ever developed! We eat a ton more veggies this way and it only takes a few minutes to prep. Now I just need a good dip recipe - I'm still stuck buying those packets of Ranch. Have you ever had cucumber water? It's just ice water with cucumber slices added & sort of "steeped" for 30 min. to an hour. 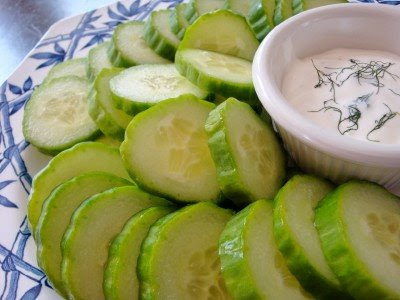 Ditch the cucumber slices & the water is cucumber-y and so refreshing! Do a post with that yogurt dip recipe. Please?? We'd love to try it. My kids think that cucumbers are a perfect snack. We are buying them for 25-33 cents a piece. So I slice them up for nearly every meal. Last night I had half a cucumber and 1 tomato. I sliced the two of them, added a bit of onion and then coated with some red wine vinagrette (leftover from a board luncheon) and couldn't believe the kids ate it up like crazy! Kids will try anything if it looks fun to eat....the dipping. My kids love Ranch Dip. I buy the low fat store brand dressing and use that for dip. The kids also love salsa and 'chips' I make from corn tortillas that I bake in the oven. My kids love cucumbers. Thanks for the reminder to eat veggies for snacks. I tend to only serve fruits and veggies for meals. My kids favorite way to eat cucumbers is also my childhood favorite...slice up a cucumber, place in a bowl, pour in white vinegar to cover, sprinkle with salt & pepper - wonderful! My grandma would even add some small diced up bits of green onion to her's. We bring treats for our birthday at work. I wanted to do something "different" then the normal desserts. So I cut up a bunch of fresh fruit (grapes, bananas, apples, pineapple, oranges, and strawberries) and made a couple of dips. It was a huge hit and everyone was glad to get something healthy for a change. Tell me, don't you're kids complain about "the grassy stuff" in their dip? Or would that just be my sweet children? oooooh, thanx for the reminder, i forget about cucumbers! like honey, we like a version of ants on a log, but here we make it with cream cheese and craisins on celery--ella calls it "ladybugs on a log". That looks so pretty. Unfortunately even the "burpless" type don't seem to be for me...any suggestions fellow readers? Bedtime snack for our two lately is 1/2 a banana each while we read stories. At Trader Joe's price that is less than 20 cents a night. Any not eaten I trim and put in the freezer on something flat til frozen hard than transfer to a freezer container to save for smoothies. Also finally tried making our own (baked, I am afraid of burning down the house deep frying) corn chips from the Costco $2.99 for 100 tortillas. on my way out to a free day at the zoo (yayyy!) - This is one my kidz' favorite snacks! SAVINGS count! But we also do 'chips' too - We balance it best we can --- Carrots for lunch with sandwiches I made myself - bottle watter - apples and oranges - and cookies I bakes lastnight - cost - FREE! The zoo will not fool mama this time - like the last 40 buck food rush we had --- WHUT HAPPENED? My kids eat cukes - yay! They also love all melons. Gotta love this time of year -- cheap good produce! Hi Meredith! I know I've come across your site a couple of times before, but didn't realize you were local to me!! I will have to read more often! I love all your creative/frugal ideas!! And when they are in the garden the price is Really right! Nothing like fresh cukes right of the vine! Amen to that! My kids are on a fruit kick right now, they can't get enough apples and bananas. Tonight for dessert between them they ate 6 bananas and 6 apples plus an entire pineapple! The most beautiful snack ever! My picky eater carefully teased the dill from the top of the dip. Elise and the neighbor's daughter dug right in. The dip is a basic ranch dressing recipe (from scratch) with homemade tangy yogurt in place of the mayo and sour cream.